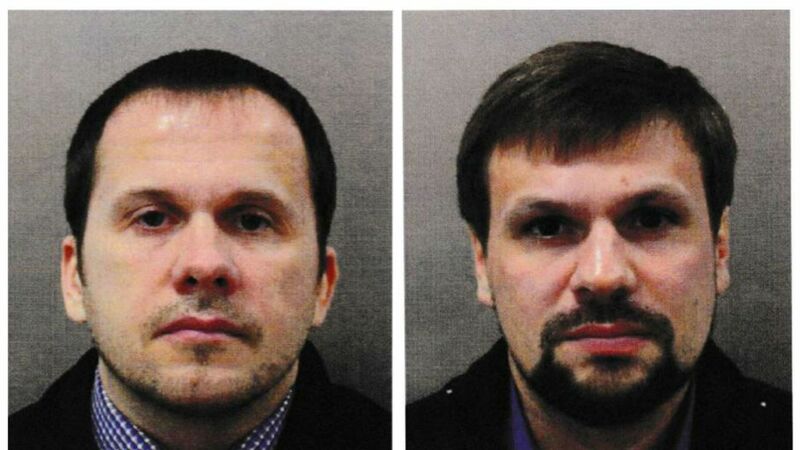 U.K. police have charged two alleged Russian intelligence officers, Alexander Petrov and Ruslan Boshirov, with conspiracy to murder, attempted murder and illegal use of a nerve agent in the poisoning of former Russian spy Sergei Skripal and his daughter in Salisbury, England earlier this year. The big picture: The poisoning has been the source of a tense diplomatic rift between Russia and the U.K. The Trump administration backed London by certifying that Russia used chemical weapons, triggering automatic sanctions, but has sought to meet with Russian foreign minister Sergei Lavrov in the hope of avoiding another escalation with Moscow. The details: Police say Petrov and Boshirov, which are believed to be aliases, fled to Moscow on March 5, a day after the poisoning. Russian law currently prohibits the extradition of its own citizens, but the U.K. has obtained a European Arrest Warrant. Prime Minister Theresa May said in a speech to Parliament that based on a body of intelligence, the suspects were officers of the GRU — the Russian military intelligence service that Special Counsel Robert Mueller has accused of running an active cyber operation to interfere in the 2016 U.S presidential election. "The GRU is a highly disciplined organization with a well-established chain of command," May said. "So this was not a rogue operation. It was almost certainly also approved outside of the GRU, at a senior level of the Russian state." The two men are also now prime suspects in the death of Dawn Sturgess, a British woman who was exposed to Novichok in June.